Almost all of the great leaders of the Bible have at least one thing in common. Noah, Abraham, Moses, Joshua, some of the Judges, several of the Kings, especially King David, Esther, all of the prophets, John the Baptist, Peter, James, John, Paul – all of these men and women were by no means perfect people, but they all had at least one thing in common which allowed God to use them greatly. Almost all of the people used greatly by God throughout church history have at least one thing in common. John Chrysostom, Jerome, Augustine, Martin Luther, Zwingli, Tyndale, Wycliffe, D.L. Moody, Billy Graham, Chuck Smith—all had one thing in common. Almost all of the people who do amazing things for God have at least one thing in common. What was this one thing? They were all hearers and doers of the Word of God. Do you dream of God using you? Of God speaking through you? Do you dream of doing great things for God? The place to start, the thing to focus on, is to become a life long student of the Word of God, and developing a habit of obedience to it. Beginning today, and then for a few more weeks, we are going to see five people in Luke 2 who were knowledgeable about and obedient to the Word of God. As a result of their knowledge and obedience, God used them greatly. He spoke to a few of them regularly. They became heroes of the faith. Today we will look at two. So far in the book of Luke, we have seen the events leading up to the birth of John the Baptist and the Birth of Jesus. Last Sunday, we looked at the birth of Jesus itself and the difficulties Mary and Joseph had to endure at that time, but how God turned things around for good. Today we will learn more about this wonderful couple, and how they lived in obedience to the Word of God, and so were influential in raising the Son of God. We will see that Mary and Joseph obeyed the law so that Jesus could fulfill the law. We will see that Mary and Joseph’s careful obedience to the law were key factors in preparing Jesus for his earthly ministry. Let’s begin right away in Luke 2:21. Luke 2:21. And when eight days were completed for the circumcision of the Child, His name was called Jesus, the name given by the angel before He was conceived in the womb. In this verse, we see two examples of how Mary and Joseph obeyed God’s Word. First of all, they circumcised Jesus eight days after his birth. It says in Leviticus 12:3 that all Jewish males are to be circumcised on the eighth day after their birth.This was a very important ritual in a Jewish family, because the circumcision of the males was a sign that they were a people set apart unto God. It was the sign and seal of the Abrahamic Covenant (Gen 17). Every good Jewish family would have this done to their son, but it was especially important for Mary and Joseph to make sure Jesus went through the ceremony, because He was definitely set apart for God’s service. We know from the book of Hebrews that Jesus has experienced life in every way just as we do, yet without sin. But we see here that some of His steps of obedience were dependent upon his parents, Mary and Joseph. What would have happened, I wonder, if Mary and Joseph had not had Jesus circumcised? Since they were under the law, that would have been disobedience for Mary, Joseph AND Jesus. So you see parents, it is very important that you take an active role in making sure that your children learn the Bible and obey it, because you are held responsible to some degree for how your children behave, and even much more so when they are infants and cannot make such decisions for themselves. Mary and Joseph knew that they were instrumental in training and raising Jesus according to God’s Word, just as all parents are, and so they made sure that Jesus was circumcised on the eighth day. Jesus obeyed later in life, partly because Mary and Joseph taught him to obey. And they obeyed all of God’s Word. Not only God’s Word as recorded in the Old Testament, but also God’s Word which had come to them through the angel Gabriel. In the second half of verse 21, we see that they are obedient in naming Jesus. Remember in Luke 1, Mary was visited by Gabriel, and he told her to name her son Jesus (1:36)? Mary has remembered that, and has certainly told Joseph of it also, and so at the circumcision ceremony, they name Him Jesus. We have also seen that Jesus was probably born on the first day of the Feast of Tabernacles, which is a feast that lasted for eight days. The last day of the feast was the greatest day of the feast, and so it was on this greatest day of the Feast of Tabernacles which Jesus was named. There is so much about the Feast of Tabernacles which is significant, but for now, let me tell you what would happen on the eighth day of the feast. The eighth day of the feast was a very special day. The first and last days of the feast were sacred, and were treated like Sabbath days – they could do no regular work on those days (Lev 23:33-36). And the first seven days had a celebration atmosphere about them. There would be singing and dancing and celebrating as millions of people from all over Israel gathered in Jerusalem to camp out in temporary shelters on the streets of Jerusalem. It was kind of like a religious Woodstock, I suppose, except there weren’t bands and musicians for people to go and listen to, instead they had a great preach-a-thon. You can read about one that they celebrated in Nehemiah 8. There, for an entire week, they would meet in the morning, somebody would read a passage from the Scripture, and then one of the priests would explain it, verse by verse, line by line. And day by day, as these sermons were given, the Israelite people responded to them, and obeyed, and repented of sins, and made changes in their life to live more for God. And they would listen to sermons, and then go and eat and celebrate and sing and rejoice, and then come back and hear another sermon. And just at that time, we can imagine Mary and Joseph and their friends and family gathering together with an eight-day-old baby Jesus in their arms for the circumcision and naming ceremony. And as the worshippers chant, “The voice of the coming of the Messiah is heard” maybe they could hear Jesus cry out in pain from being circumcised, and Joseph, lifting up Jesus in his arms and praying, “Our God and the God of our fathers, raise up this child to his father and mother, and let his name in Israel be called Jesus, for He will save His people from their sins” (Matt 1:21). Jesus’ name, in Hebrew, Yeshua, or Joshua, means “The Lord saves.” It was quite a popular name in that time. But Mary and Joseph’s naming ceremony would be different from all the others, because in Matthew 1:21, Gabriel told Mary that Jesus would save his people from their sins. And they were obedient to this. On the eighth day, Mary and Joseph obeyed the Word of the Lord and named Him Jesus. And because they obeyed God’s Word, the voice announcing the coming of the Messiah, was truly heard. When God’s people obey God’s Word, the coming of the Messiah is announced. When you obey God’s Word, a natural result will be that we will also announce Jesus Christ as the Messiah, as the Savior of the world. When people see us, and the way we live according to the Word of God, hopefully, they will also see Christ and his light shining through us. 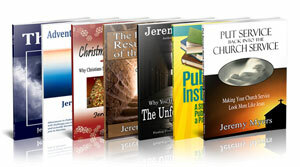 That is what Mary and Joseph accomplished as they lived in obedience to God’s Word. But they are not done. In 2:22 we see another way they were obedient to God’s Word. They obeyed God’s Word in purifying Mary. The NIV and NAS have “their purification.” This means the baby’s and hers. You see, the command in Leviticus 12 is that a woman who bears a son must wait 40 days before she is considered pure and 80 days after bearing a daughter. At the end of her 40 days of purification, Leviticus 12 instructed Mary to bring a sacrifice to the temple of one lamb, and one turtledove or one pigeon. For families that were extremely poor, they could offer two turtledoves or two pigeons instead. We see from Luke 2:24 that this is what Mary offered for herself, and so we know from this that they were a very poor family. Mary and Joseph were poor and yet had great faith and were very obedient to God. And they didn’t let being poor get in the way of obeying God. Some people teach that if you are poor, you are disobeying God somehow. Others say that if you are poor, somehow that means you don’t have to obey God – like in tithing or supporting mission’s work. But Mary and Joseph did not let being poor get in the way of obeying God. Not having very much money should never be an excuse for disobeying God. There is a whole theology of money, riches and rewards that we could get into here, but let’s get back to Mary’s purification. Mary was very conscientious in her obedience to God, and went through her 40 days of purification and made her offering to the Lord, two turtledoves or two pigeons. She could not afford to bring a lamb. But interestingly, she did bring a Lamb that day. She held One in her arms who would purify her from all sin. It is somewhat ironic again. She could not afford a lamb to purify herself from the uncleanliness that had resulted from bringing the Lamb of God into the world, who was going to purify her from all uncleanliness! This sacrifice for Jesus, troubled Mary and Joseph a little bit. I’m sure it bothered them that the only sacrifice they could offer for Jesus was a poor families sacrifice. But nevertheless, they obeyed. And they obeyed again when they presented Jesus at the temple, as we read about in verses 22-23. These commands which Mary and Joseph obey regarding Jesus come from Exodus 13 and Leviticus 27. The law was a result of the tenth plague in Egypt. The tenth plague was when God struck dead all the firstborn sons of the Egyptians, and any of the firstborn sons of Israel who did not have the blood of the Passover lamb smeared on the door posts of their house. Because of this event, God wanted the Israelites to set apart all the firstborn animals and all the firstborn males for Himself. The firstborn animals were to be sacrificed to the Lord, and the firstborn males were to be set apart for life-long service of the Lord (Ex. 13:11-16). They were going to be the priests of God. “But the tribe of Levi became the priests,” you say. That’s right. You see, when Moses came down from Mt. Sinai with the law, and he saw the children of Israel worshipping the golden calf, he called all men to himself who were on the Lord’s side (Ex. 32:26) and sent them out to kill the idolatrous Israelites. We read in Exodus 32 that all the men of Levi responded to Moses’ call, and as a result, the tribe of Levi was set apart to be the priests of God. But God didn’t need both the Levites and all the firstborn males. So he set up a way in Leviticus 27 for the firstborn males to trade places in a sense with the Levites. They parents of the firstborn males would come to the temple, and pay five shekels of silver to the Levites for their son, in a sense, buying their firstborn son back from the temple service. And the Levites would take this money and buy the things they needed to live and serve in the temple. So this is what Mary and Joseph to for Jesus. They go and redeem Him at the temple for about five shekels of silver (Lev 27:6; Num 18:16). That’s about 2 ounces of silver, by the way. Jesus is sold for 30 pieces of silver later in his life as well, but that’s another story. Do you see the irony here in Luke 2:23 with Jesus being redeemed? Jesus himself is the Redeemer, and He had come to redeem the world, but He himself had to be redeemed. Furthermore, his parents, though they were very poor, had to pay five shekels of silver for him. This is ironic because Jesus owned the world and the entire universe, yet he had to redeemed with silver. We are not redeemed in such ways, but Jesus was so that He could fulfill the law, and thus become our Redeemer. 1 Peter 1:8 says that we are not redeemed with silver or gold, but with the precious blood of Jesus Christ. Jesus is only able to offer us eternal life because He lived without sin. It is only because He is without blemish, and only because He fulfilled all the law, and only because He paid the full price for our salvation, that He can give to us eternal life freely – to any who believe in Him for it. Mary and Joseph played a part in this, as we have seen already today, in raising Jesus. This point is summarized and emphasized in verses 39-40. We will look at Luke 2:25-38 in the next study. But the final point is that Mary and Joseph obeyed God’s Word in raising Jesus. Luke 2:39-40. So when they had performed all things according to the law of the Lord, they returned to Galilee, to their own city, Nazareth. And the Child grew and became strong in spirit, filled with wisdom; and the grace of God was upon Him. It is at this point that they returned to Nazareth. Now, Luke does not record it, but we know from Matthew that before they returned to Nazareth, the wise men showed up in Bethlehem, and then Mary and Joseph flee to Egypt, and only then returned to Nazareth. It is in Nazareth where Jesus grew up, and was raised by his parents. But Luke 2:40 shows us that although he was like other children in some ways, He was unlike them in others. As Jesus grew physically, he was also developing mentally and spiritually. All three are necessary for the proper growth and development of children. But see verse 40? While most children are weak in their understanding of spiritual matters, Jesus was strong in spirit. Some of the translations don’t say “strong in spirit”—only that he was strong. But I side with the position that it should say “strong in spirit.” Jesus not only grew physically, but he also grew spiritually. Next we see that while most children are foolishness bound up in their hearts (Prov. 22:15), Jesus was filled with wisdom, and while most children produce both good and evil actions, Jesus only revealed that the grace of God…upon Him. Luke 2:41-52 go into much greater detail on some of this, so we will look at that in studies to come. Parents, very often, we focus on making sure our children are growing strong and healthy physically, and we send them to school to develop mentally – but what steps are you taking to make sure they are developing spiritually? “Oh, we to church as a family.” Good, wonderful…that’s a start, but it is not enough. None of you would only give your children one meal a week, would you? No, of course not, they would be malnourished, sickly and underfed. In the same way, you need to make sure your children are getting a steady diet of the Word of God. And the church wants to help you in this – we have Sunday school on Sunday morning, and AWANA on Wednesday nights. But beyond this, it is vitally important, according to numerous passages throughout the Bible – Deuteronomy 6 is one example – that the parents, and especially the father, teach the Bible to the children. And again, if you don’t know how to do this, or where to start, the church wants to help you. Sunday nights we are teaching through the Old Testament, we’re in Genesis tonight, and Wednesday nights in the men’s Bible study, for you fathers, we’re studying through the New Testament, we begin in Acts this Wednesday. So here is how it works. You come, and you learn, and then you go home and teach these things to your family. Now if you’re doing other things to teach your family, that’s great, keep on doing it. But if you’re looking for some direction and some help, well, come join us, so that we can all help one another, to raise spiritually strong children. We can be certain that part of Jesus’ spiritual development was due to Joseph and Mary, but especially Joseph teaching the Bible to Jesus. 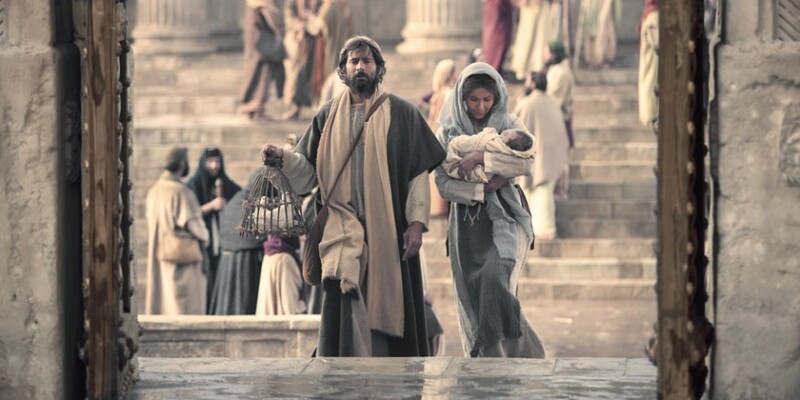 Joseph has shown that he and Mary want to obey the whole law, and part of the law, as I mentioned, was for fathers to teach the Bible to their children. So we can be certain that Joseph taught Jesus the Word of God. And if he taught Jesus, we certainly need to teach our own children as well. Some people hear that and say, “Oh, Jesus didn’t need to learn the Bible – he wrote it!” Well, that’s a debatable issue, and we’ll look at in more in two weeks. I believe Jesus did have to learn the Bible because he was human, just as we have to learn it. Today though, let us close out with a lesson about why it was important for Mary, Joseph and Jesus to be so careful and complete in their obedience of the law. In Matthew 5:17-18, we learn that Jesus came to fulfill the law, not to destroy it. You see, the only way Jesus could be our Savior was if he fulfilled all the requirements of the law. This is impossible for any man to do. But Jesus Christ, since He was God, could do it. And so, Jesus Christ was born under the law. He was circumcised according to the law. He was redeemed as a firstborn as the law commanded. And he lived his whole life in obedience to the law, so that, according to Galatians 4:1-7 and Romans 6:14-17, we do not have to. He was circumcised so that He might become sin for us (Gal 5:1-5). He was named so that He might become our Savior. Mary was purified as a picture of how Jesus would purify us all. Jesus was presented and redeemed at the temple to show us how He would redeem us all so that we can be presented holy before the Lord. And Jesus was raised to maturity showing that all of us need to also grow in to Christ-like maturity. And how does all of this happen for us? In two ways: First, Jesus has fulfilled the law because we never could. You will never be purified from sin or redeemed to God through obeying the law. Jesus already did that for us. All we have to do, to be purified and redeemed, is believe in Jesus for eternal life which He bought for us with his own blood. It is bought and paid for through the complete obedience and precious blood of Jesus Christ. You don’t have to pay for it. All you have to do is receive it through faith in Jesus Christ. Mary and Joseph did this, and they were used greatly by God in raising Jesus Christ. And as we do the same thing, hearing the Word, and obeying it, God will use us as well. Fuchs, Israel’s Holy Days in Type and Prophecy, 77. Henry, Matthew Henry’s Commentary on the Whole Bible, 1831.